Streptococcus (S.) agalactiae (contains the CAMP factor) is a round bacterium that could cause severe invasive infections. Biologists team led by Prof. JIN Tengchuan from University of Science and Technology of China of Chinese Academy of Sciences and Dr. Eric Brefo-Mensah from University of Waterloo revealed the structure of S. agalactiae CAMP factor and the mechanism behind for the first time. Research article was published in the Journal of Biological Chemistry on June 8th. 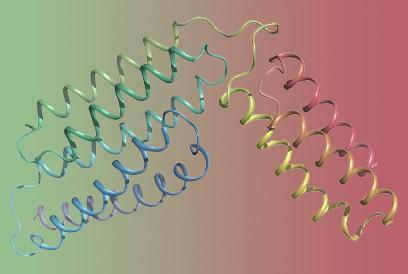 By utilizing X-ray diffraction technique, researchers reported the structural fold of S. agalactiae CAMP factor is composed of 5+3 helix bundles, where the N-terminal 5 helix bundle is believed to be responsible for membrane permeabilization and the C-terminal 3 helix bundle is likely responsible for host receptor binding. Besides, the C-terminal domain is revealed to inhibit the activity of both full-length toxin and its N-terminal domain. The researchers also observed that the linker region has a conserved DLxxxDxAT sequence motif, which is required for CAMP factor's co-hemolytic activity. The results helped clarify the molecular mechanism of S. agalactiae's co-hemolytic activity. What the researchers illustrated may assist to the screening of anti-CAMP virulent factor drugs and inspire more to reveal the nature of the interaction between proteins and biofilms. This research was supported by several funds and programs of the Chinese Academy of Sciences and the Canadian Natural Sciences and Engineering Research Council.